We are an independent, regional ancillary health care provider with a history of exceptional service. We provide Medical Rehabilitative Therapy on a contract basis to skilled nursing facilities and other health care institutions, Medicare Certified Home Health services throughout Ohio, and operate Medicare Certified Outpatient Rehabilitation clinics in Ohio and West Virginia. We also offer specialty health care services for employers, senior care centers, senior housing centers and the Assisted Living Industry, as well as individually tailored disease management programs through our Home Health Agency. Since our founding in 1989, Marden has emphasized superior service and business integrity in order to improve the quality of life of our patients. 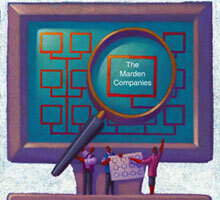 Today, Marden cares for patients in client health care facilities, in their homes, and at our own outpatient clinics. With more than 300 employees throughout Ohio, Pennsylvania, West Virginia and Kentucky, we are Quality Professionals providing Quality Care.